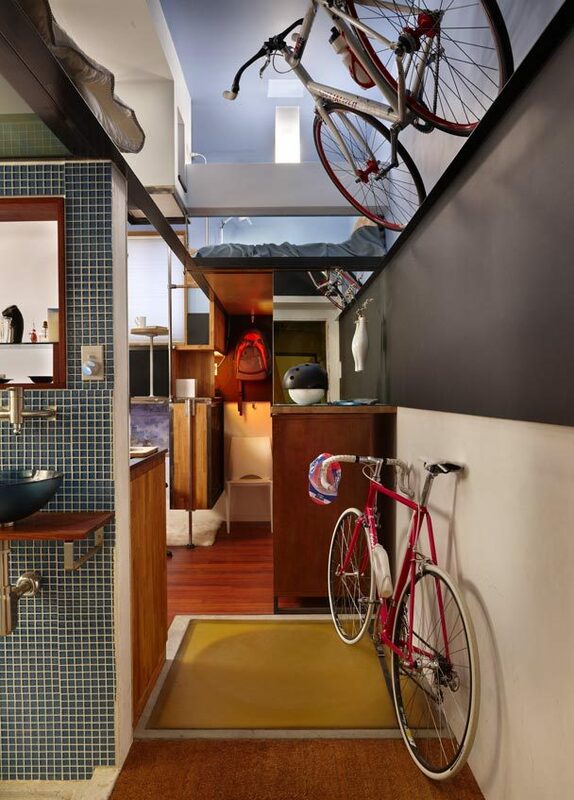 What Does a 182 sq ft Triplex Look Like? Steve Sauer is serious about efficiency. 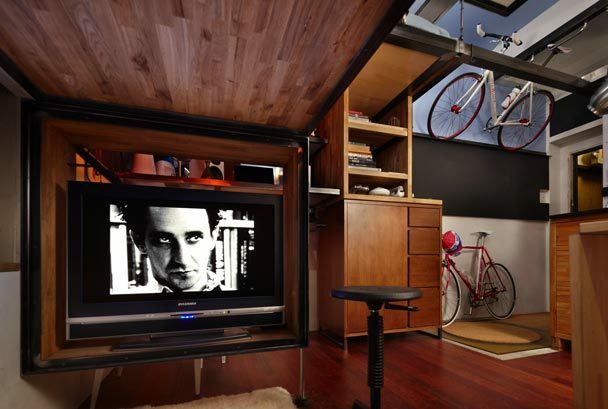 His 182 sq ft Seattle apartment has virtually no unused spaces and zero redundancies. Fittingly, Sauer is an interior designer for Boeing and a holder of a Masters in whole-systems design. The genesis of began after he started looking for storage space for his stuff. 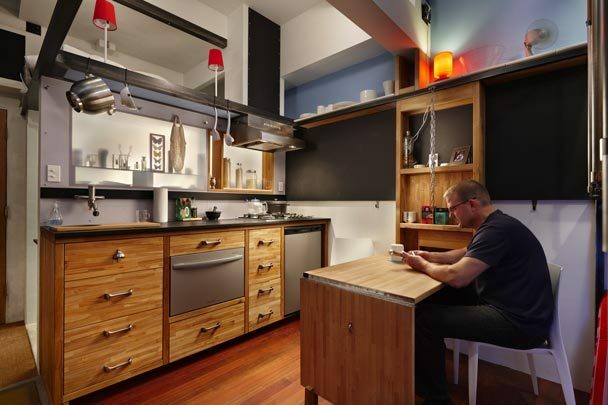 When he found an available space in a coop building, he realized that with proper design, it could house him and his stuff. He made a list criteria like being “quick to clean and have” and provide “room for current needs only.” Every decision had to be intentional. He claims that each product represents 10-100 hrs of internet research. What he couldn’t buy he made. 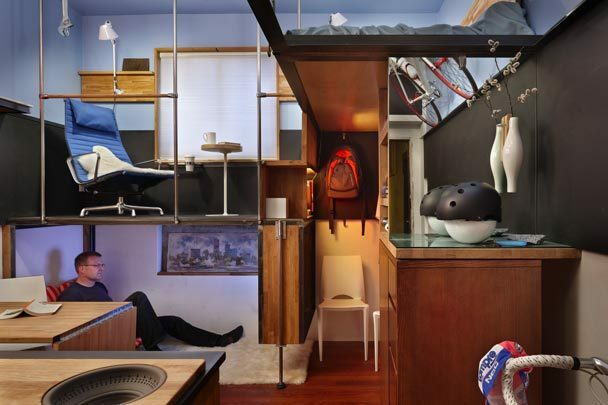 The result, which he duddbed “Pico Dwelling” (pico is 1/trillionth) is an amazingly efficient space featuring two sleeping areas, 3 levels, a recessed and covered Japanese soaking tub, a video lounge, a cafe and many other amenities. Another intention Sauer had for the space was to “compress my home to squirt me back out to the community.” In other words, the space was so small, he’d have to engage his community. That said, he has had up to 10 guests in the space at a time. 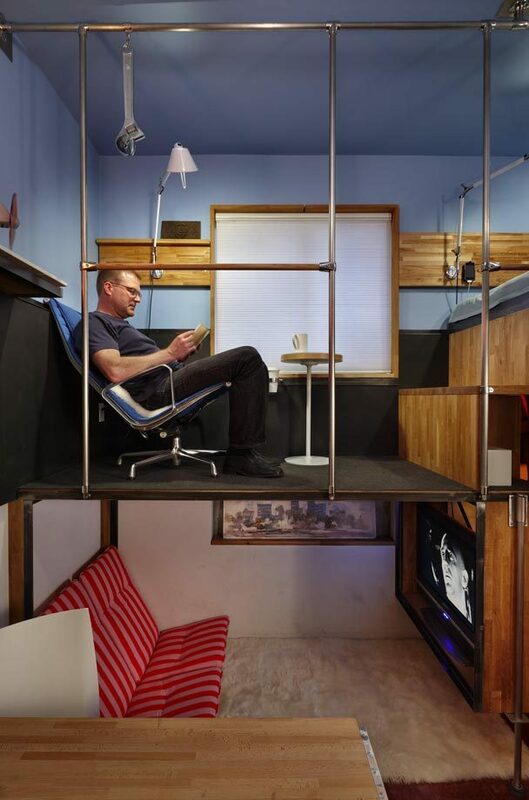 I’ve spent some time staring at these pictures, and trying to figure out why I dislike the space so much, as opposed to many of the tiny house which are no bigger which I find attractive. I suspect the primary problem is the multitude of surface treatments, colors and textures. Worse, they aren’t even consistent there are different woods (both in type and hue) for the floor and built ins… and it’s hard to tell but it might be even his some of his built ins are yet a third wood . Even when things are similar in color they are wildly different in texture so the grey of his appliances is matte and the silver of his fume hood is brushed and shiny. Visually it ends up as jumbled mess. I not a huge fan of modernist color schemes but if he had limited himself to 4 colors or materials and carried it across multiple surfaces it would go a long way towards bring the room into harmony. In spite of his claims I view the “cafe” and “video lounge” as having some overlap… which is basically relaxed seating, but really that’s quibble over personal preference. Things I *do* like, is the use of daily use objects as part of the design, the bike helmets and the wrench put on display as if they were art is an interesting way to elevate the objects that are important in his life. 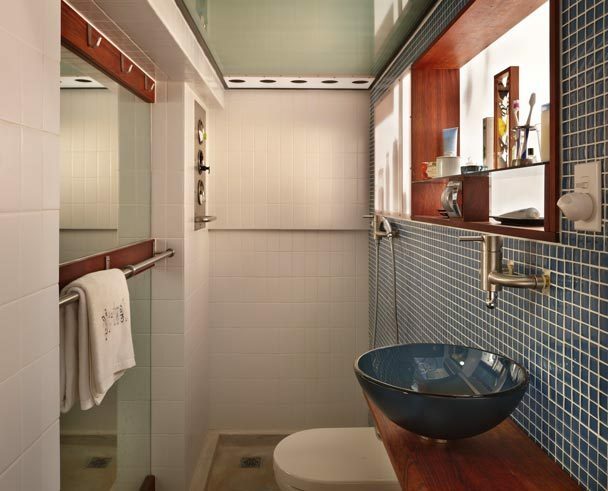 I also like the use of pipe as room divider serving double duty as grab bars. 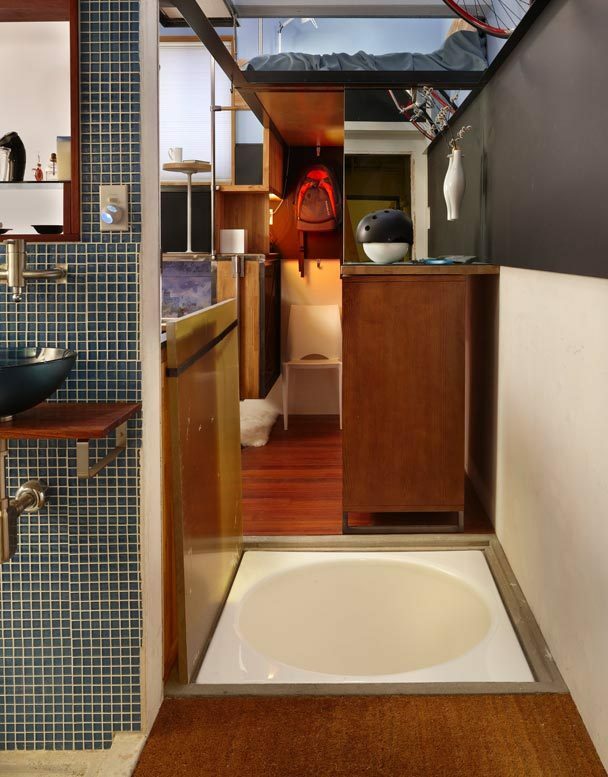 I like the addition of a Japanese soaking tub, but am not sold on it’s placement. Does it say someplace how high the ceiling is? I agree with Learethak the primary problem is the multitude of surface treatments, colors and textures. It looks so cluttered and anything but simple and nice. The first and last photos literally made me dizzy and anxious to leave the site. Thus it looks like a storage unit not a home.